Even though the first two days of this week were spent by most Americans celebrating the Fourth of July, there were still a ton of happenings in the iOS gaming arena. Kicking things off was a story surrounding a puzzling update from Five Nights at Freddy's creator Scott Cawthon. Now, this comes with the massive caveat that Cawthon is no stranger to (intentionally or unintentionally) trolling his audience with updates on the state of development of games in the Five Nights at Freddy's series, but, you really never know. If Scott Cawthon is to be believed, he's been working on Five Nights at Freddy's 6 but eventually decided to pull the plug on the project due to the pressure that comes from trying to develop another unique entry in the series — particularly with the sky-high expectations surrounding another FNAF sequel. Allegedly, instead he's going to be working on smaller projects loosely based on the FNAF universe like the upcoming movie, a VR title, and other things. What has us raising our eyebrows particularly high on this one is that Five Nights at Freddy's: Sister Location was “delayed” because it was “too scary” and then the game was released four days later. Either way, kids are (still) crazy for FNAF, so it seems worth paying attention to, even if these odd updates seem like a strange way to promote a game. 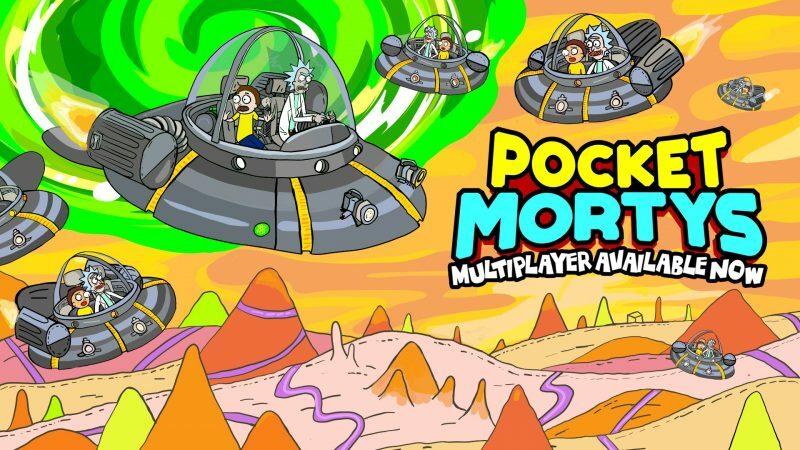 With Season 3 of Rick and Morty only a few weeks away, Adult Swim has updated Pocket Mortys with online multiplayer battles, new dimensions to explore, and tons of other things. Pocket Mortys features a supremely agreeable free to play system that feels truly optional, and is easily among the best, if not the best Pokemon-like game on the App Store. It's packed with Rick and Morty fan service, but even if you've never seen the show, it's a fantastic collection and battling game only made better by this update. Another Rome: Total War port is on the way to the App Store, and this time players will travel back in time to an entirely new scenario that begins with the Macedonians and escalates all the way to the Persian Empire. Rome: Total War – Alexander will launch as a standalone expansion for $4.99 soon. The original iPad port of Rome: Total War was received incredibly well by fans of strategy games, so it seems safe to assume Alexander will be just as good. Telltale's Minecraft: Story Mode is a clever mash-up between Telltale's signature narrative-based games and the Minecraft universe which has practically no story in it at all. The first season of the game spanned eight individual episodes that at times felt a lot like playing a Minecraft-y version of the movie The Goonies. Few details are available yet for the second season except for the trailer and the release date of July 11th, but we'll be keeping a close eye on this one. The original Sorcery! is now available for free on the App Store, and is a game everyone should download during this promotion. We've written extensively about the game, but CliffsNotes effectively amount to Sorcery! is easily among the best game books on the App Store. If you've never played one, imagine Choose Your Own Adventure novels from when you were a kid, but fleshed out to an unbelievable extent. There are two more entries in the series, so if you find yourself enjoying Sorcery! be sure to check out the two sequels. While it seems like everyone and their brother is riffing on Supercell's Clash Royale these days, Tilting Point and Simutronics released Siege: Titan Wars this week which is another incredibly polished spin on the formula. Players dispatch swarms of troops and powerful titans, and unleash magic spells in realtime PvP battles. This style of game works incredibly well on mobile, so if you weren't into Clash Royale for whatever reason, it's worth giving this one a try. In Hearthstone news, surrounding rumors, speculation, and legitimate leaks, Blizzard finally announced the next Hearthstone expansion: Knights of the Frozen Throne. Launching next month, Knights of the Frozen Throne is loosely based on the World of Warcraft expansion Wrath of the Lich King, but with the requisite signature Hearthstone twist. New Death Knight Hero cards are being introduced, which provide each class with a new Undead-centric hero power. Finally, Tencent's Honor of Kings will be launching globally this year. It's unlikely you've heard of this game unless you're in China, but Honor of Kings has been unbelievably successful, sporting over 50 million daily active users and raking in over $140 million a month. The game is so popular in China that the developers were actually forced to limit how much people can play it by the Chinese government. It's a situation that's almost impossible to believe, but I'm incredibly curious to see how it does outside of Asian markets. That's it for this week! As always, if you appreciate these iOS gaming roundups and are interested in way more content like this, head over to TouchArcade where we're posting iOS game news, reviews, guides, and more all day long. We've got an iOS gaming Twitch channel, a fantastic Discord server, and a weekly podcast that are also all worth checking out.